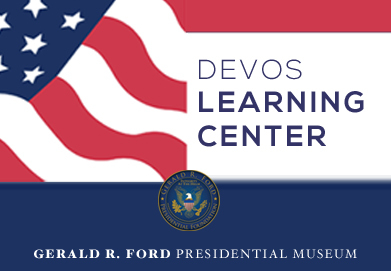 The DeVos Learning Center at the Gerald R. Ford Presidential Museum has welcomed its youngest learners yet! Preschool students from Hamilton Early Childhood Center in Kentwood were the first to participate in our new program, Liberty’s Lessons of Courage. Students learned all about President Ford and the many times he showed the character trait of courage from a very special tour guide, Liberty, the Ford’s cherished golden retriever and former White House resident.